Regular readers will know I'm partial to the odd ride along a mixed-use trail. Normally, these mini-adventures are undertaken with that fine fellow Tim from Life in the Cycle Lane and, more often than not, are an excuse to indulge his baffling affinity for the Trans Pennine Trail. Riding these routes has its problems though - largely confined to other trail users. We always try to be considerate on these Troll-fests, normally favouring a polite 'on your right' when overtaking walkers. Horse riders are given a respectful wide berth too. However, increasingly I hear grumbles from walkers as I trundle by along the lines of 'Where's your bell?!' Both Tim and I feel the bell can be more offensive than a verbal warning but, in the interests of 'scientific' enquiry, I decided to equip the Bob Jackson with one ahead of this year's Eroica. As this was the Bob I was looking for something suitably retro. I'd found a fine example for a tenner amid Eroica's tempting stalls but then came across Lion Bellworks. Their rather splendid brass bell was another fiver. Maybe it was the quantity of gin I'd consumed or the fact that Lion bells are assembled in Manchester that prompted me to cough up the extra dough. Actually no, the Lion emitted such a becoming 'ding' I was immediately hooked. Aware of the importance of the sound, Lion have posted an audio file on their web homepage. It's easily described though. Flicking the elegant hammer against the brass body produces a sound that would summon Andrew Sachs as Manuel in Fawlty Towers. The Lion is beautifully made and fits securely to a quill stem, a strip of cork on the bracket ensuring the bell remains put and is free from rattles in use. Hmmm, can't please everyone I guess. This is a lovely product and is highly recommended. The only downside is the bell will tarnish so requires regular polishing. After hearing one of these wonderful brass bells chime, there's no way you'll settle for anything else. Not only do they warn passers by of your impending two-wheeled arrival, they'll carry on resonating long after you've zoomed past. Lion is, it reckons, the only manufacturer of bike bells left in the UK. With the impressive "LION ENGLAND" stamped on the polished brass dome (you can also get them custom engraved) these are a must-have for any retro bike build. The real feature of this bell, apart from its good looks and beautiful sound, is that it is made in "England". It has the words "Lion England" stamped into the top of the bell. As a bell ages and a natural patina develops this feature will look fantastic. This is also fantastic for restorers of vintage English bicycles as it adds to the British feel of the bike. I have noticed that other similar styled brass bells that adorn vintage bikes are Japanese made...and are not quite the real deal! These bells have a superior tone to any other bell I've had. It's a crisp tone that can be heard for miles....pedestrians will be in no doubt that you're on the way! 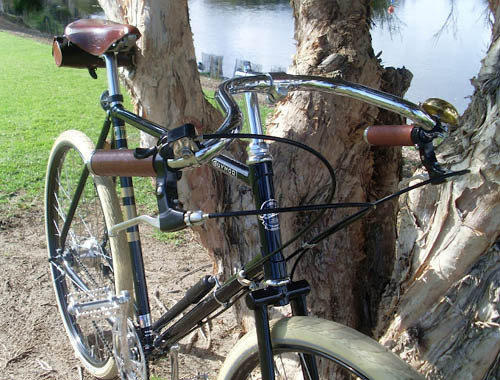 I have mounted a Lion Bell to my Pashley Guv'nor. The Lion Bell is bigger and sounds far better than the bell that originally came on the bike. It would not surprise me if Pashley started fitting English crafted Lion Bells to their bicycles as standard in the near future. Much of my cycling involves the use of paths and tracks that are shared with other cyclists as well as walkers, joggers, horse riders et al. And so, to maintain harmony between all I favour a friendly ring of the bicycle bell to alert others of my presence. The problem is that the majority of bike bells available on the market today are frankly rubbish, at best they ping as opposed to ring and those that do ring are ineffectual as an attention getter. The Retro Brass bicycle bell designed and manufactured in England by Lion Bellworks echoes the great tradition of both English bell makers and classic retro bicycles. The bell dome is made from solid brass and the mounts from laser cut stainless steel. The design is elegantly simple with a spring mounted striker positioned outboard of the dome providing a loud and musical sound with a long sustain. In practice the bell fulfills its function beautifully, the loud musical note rings at the perfect pitch to gain attention but does so without annoyance, even in the most pastoral of settings.